Liver fluke in Angora goats is very rare due to the arid environment of the karoo in which the Angora goats are farmed in South Africa. 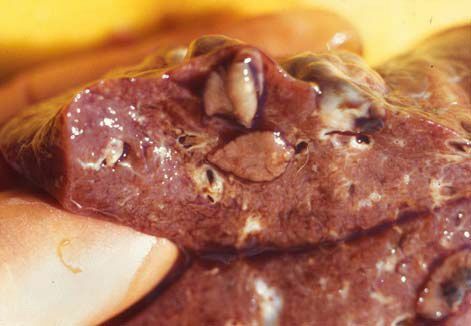 Liver flukes are usually associated more with sheep and cattle grazing in cooler parts of the country where permanent or semi-permanent water or marshy lands are found. 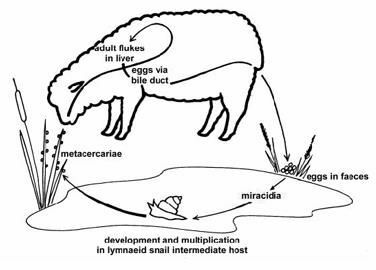 The association with water and cooler areas is due to the intermediate host of the liver fluke which is the snail Lymnaea truncatula and columella species. What clinical signs are caused by liver flukes? How does the fluke cause the damage to the liver? 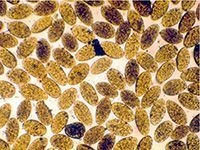 The young fluke increases 8 fold in size in 15 days as it bores through the liver. This can cause massive haemorrhage and blood loss. In milder infection they cause hepatic fibrosis and inflammation of the bile ducts. They can affect the blood supply to the liver and result in hypertension. The flukes also ingest plasma protein but this is less important than the anaemia which is caused through blood loss. Initially during the first 6-7 weeks the flukes migrate through the liver tissue and causes a mild anaemia (unless infection is massive causing haemorrhage) through loss of blood from the migration tracts. When the flukes arrive in the bile ducts the are avid blood suckers and anaemia develops rapidly. In early infection haemorrhagic tracts tract and sometimes fibrino-haemorrhagic deposits on the serosal surface of the liver. Mature flukes can be found in the bile ducts. When the bile ducts are cut flukes, debris and clumps of eggs may pour out. The lesions heal by fibrosis and areas of the liver become fibrotic. The left side of the liver is usually more affected. Treatment in autumn and early winter (period maximum risk). Treating in late winter/spring may reduce eggs and so reducing infection rates of snails.